Hello and goodnight, Curtis Scott hits Dylan Walker. FORGET the royal wedding, the real drama and theatre on Saturday night was found at AAMI Park in Melbourne as a Cameron Smith-less Storm went down to the Manly Sea Eagles. 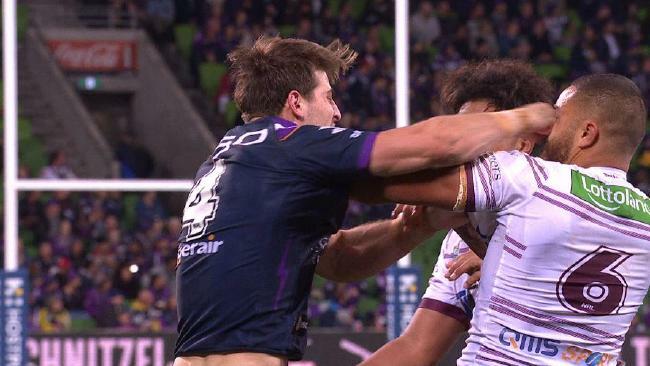 Storm star and Origin hopeful Curtis Scott became the first man in three years to be sent off after throwing a wild punch at Dylan Walker in the second half. The Storm were in all sorts, failing to score a try on home soil in a gruelling 80 minutes of footy. 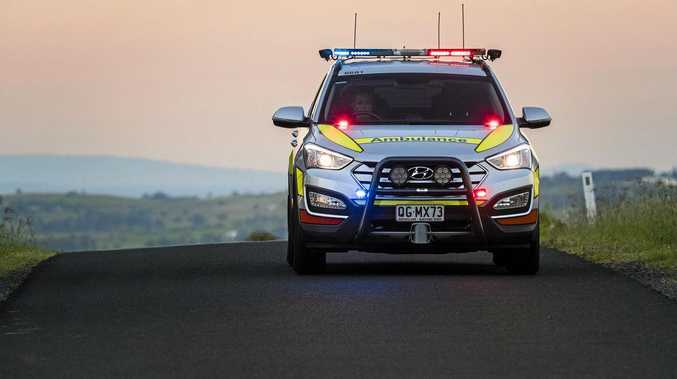 Earlier in the night, the Gold Coast Titans rocked back from the edge of defeat to seal a thrilling 33-26 victory against the Knights, while the Cowboys threw away victory on the final bell with a penalty against Jake Granville offering South Sydney a 20-19 win on full-time. In Melbourne, Curtis Scott was sent from the field after giving Dylan Walker a shiner midway through the second half as Melbourne and Manly squabbled in a low-scoring slugfest in the Victorian capital. The blue that followed had fans up in arms after the referee sent Walker, who was the first to cop a punch, to the bin alongside Api Koroisau. 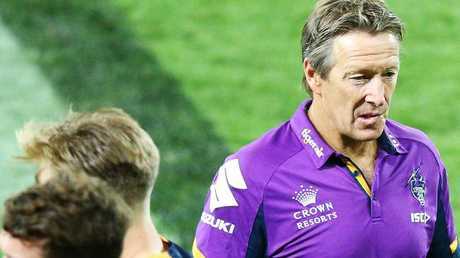 Melbourne NRL coach Craig Bellamy and stand-in skipper Billy Slater didn't mince words as they described the Storm's performance in their 24-4 loss. The Storm failed to score a try, while the Sea Eagles scored four, and doubled Manly's errors with 16 in the match AAMI Park. They completed their sets at a season-low 61 per cent with Manly topping the 80 per cent mark. 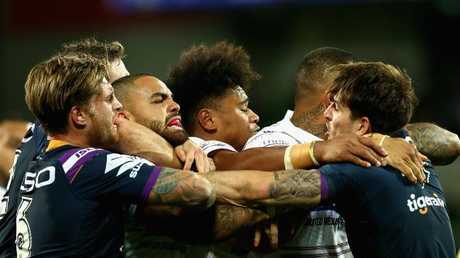 Winger Josh Addo-Carr was also put in the sin-bin for a professional foul and Nelson Asofa-Solomona on report for a dangerous tackle. Manly and Melbourne players wrestle. "It was madness out there really but I can't remember the last time we've played this poorly, especially in the second half," Bellamy said. "I thought we did a reasonable job in the first half but the second half was crap. With regular skipper Cameron Smith suspended for the match, Slater took the reins for the first time in his 15 years at the club but it is likely to be one will want to forget. "It lacked a lot of things," a shattered Slater said. "There were some real dumb plays, some irresponsible plays. We just didn't have any responsibility with the football. "At times we were courageous defending on our tryline but as soon as we got the ball, we'd turn it back over. "It's hard to beat anyone when you do that." Bellamy said it was up to the players to sort out their poor ball control if they were serious about mounting a proper title defence. "They need to sort out how we're going to fix it," the coach said. "We've given them some ideas but they haven't really bought into that so that will be our first job on Monday, to see the importance because it's really hard to win games with that type of completion rate." Elsewhere, North Queensland coach Paul Green will stick with the reshuffled backs set-up that almost secured an NRL victory over South Sydney. Michael Morgan was moved from the halves to fullback with Te Maire Martin playing alongside Cowboys skipper Johnathan Thurston in a game the Cowboys led going into the final minute. Morgan's drop goal gave them the lead for the first time with four minutes remaining before Adam Reynolds' penalty stole a 20-19 victory for the Rabbitohs. Both Cowboys tries came from Morgan linking with Thurston and then setting up Antonio Winterstein to dive over in the left corner. Green explained his decision to switch his backs around was more about getting the most out of Martin than Morgan. "It was probably more about how we get Te Maire more involved," Green said. "In previous games when he gets in there he lifts the tempo of how we play. I thought he was sharp and kept them honest on that side. "I thought we showed some really good signs there in attack. Morgs laid on a couple of tries. At this stage we'll probably stick with it." Thurston was quick to praise Morgan's desire to do the grunt work needed from a fullback. "Big Tom or George (Burgess) come through the line one-on-one, 120kg and he sat him on his rear end so he was good on both sides of the ball," Thurston said. "There's a lot of positives signs from tonight (in) the changes the coaching staff made. We need to take that moving forward. "We've definitely got the gameplay and structures in place to win games." 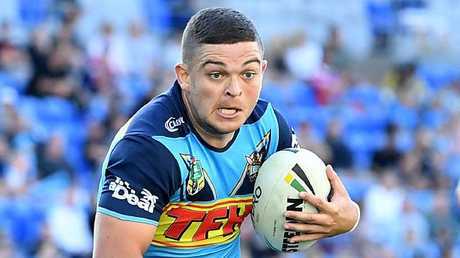 Meanwhile, Gold Coast coach Garth Brennan has heralded the rise of Ashley Taylor, with his Newcastle opposite only able to shake his head in frustration as the Titans ended a five-game losing streak. The halfback was best on ground in the Titans' comeback 33-26 win, the hosts scoring the game's last 15 points despite having two men sin-binned in a fluctuating second half at Robina. 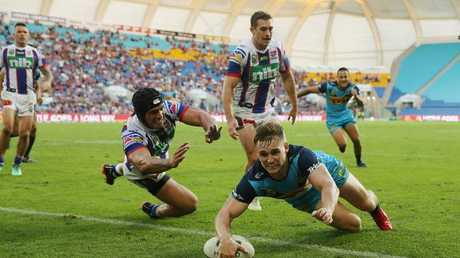 Rookie five-eighth Alexander Brimson was the man of the moment, scoring at the death to cap a remarkable comeback after some Kalyn Ponga brilliance looked to have consigned the Titans to a sixth straight loss. With the game in the balance the Knights fullback raced 95 metres, slicing through some staggered defence and then nailing the footrace for a 26-18 lead. But the game turned when Daniel Saifiti dropped the ball from the restart, the Titans piling on two tries and a field goal as Nathan Brown's side slipped to 6-5 this season. Second-gamer Brimson completed the comeback when he pounced on a loose ball, the 19-year-old mobbed after planting the matchwinner in the corner. "They were shot ducks, we were on a roll and Daniel Saifiti just dropped the ball from the kick-off," Brown said. "It's a carbon copy of the last three games ... get ourselves in very strong position and someone makes an unforgivable error." Gold Coast had both Moeaki Fotuaika and Jarrod Wallace sin-binned amid repeated time-wasting incidents, with the pair both off briefly in a penalty-laden second half. The Knights couldn't capitalise though, with the Titans retaining the lead while a man down. Herman Ese'ese and Dale Copley traded tries either side of Fotuaika's binning before Ken Sio's four-pointer was converted to give the visitors a 20-18 lead entering the final quarter. Ponga's long-range effort looked to be enough before the desperate Titans stormed home to keep their season afloat. "It was probably not our best performance but as far as character and morale, it's right up there," Brennan said. "We need to be better with our discipline ... (but) they believe in each other and that showed. "I thought Ash was enormous today; he really took control of that football team and that's a couple of weeks in a row he's backed it up." Halfback Taylor put his mark on the contest with two minutes to play in the half, drawing two defenders in another strong run before a backhanded flick pass found Copley for a 12-8 lead. He then assumed the goal kicking duties in the second-half from Michael Gordon (corked knee), kicking two from the sideline and a tough field goal to ice the win.